Within the next few decades, armed forces could be using unmanned aerial vehicles with adaptable aircraft technologies that alternate between fixed-wing flight and rotary-wing flight. Engineers from BAE Systems together with students from Cranfield University, have revealed a new technology concept — named Adaptable UAVs — which can alternate between the two different flight modes in the same mission. When in rotary wing mode the UAVs can be launched and recovered from battlefields and docked on a special pole. 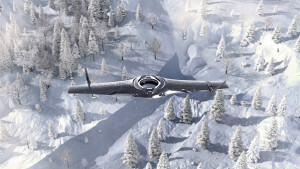 The Adaptable UAVs are a hybrid between fixed and rotary-wing aircraft, and would use adaptive flight control and advanced navigation and guidance software, which would allow the aircraft to benefit from the greater speed and range afforded to fixed-wing aircraft, before alternating to rotary-wing mode to hover and achieve vertical take-off and landing. This novel technology could allow UAVs to better adapt to evolving future battlefield situations and through working together in a swarm, tackle sophisticated air defenses, as well as operating in complex and cluttered urban environments. In the rotary wing mode of flight, the Adaptable UAVs can be easily and safely launched and recovered using a range of vehicles in dangerous environments that might be cluttered by personnel, other aircraft or vehicles. The pole constrains the lateral or sideways movement of the UAV when being launched or recovered so strong winds cannot dislodge them and avoids any damage to personnel nearby. This is particularly important when recovering a UAV to the aft of a ship or a land vehicle. The pole’s gyro-stabilized element also ensures that it remains upright independently of the host vehicle’s orientation, which may be rolling if on a ship, or in the case of a land vehicle driving up or down a slope at the time of the launch or recovery.